In goal-setting conversations, advisors often jump too quickly to the methods and strategies for achieving financial milestones rather than diving deeper into their clients' unique hopes, values, and drivers. By helping to uncover clients’ personal goals and motivators, you not only help them visualize and articulate actionable, achievable objectives, but you also help them buy into the goal-setting process and empower them to take control of their decisions. During goal-setting conversations, you may find that many clients offer vague, unspecific descriptions. At this level of understanding, I like to compare it to a watercolor painting; it’s appealing and beautiful, but nothing is sharply defined. Consider using the following strategies to help your clients gain focus and clarity as to exactly what they want and, just as important, why. Career: Do you enjoy what you’re doing and where you’re doing it? If not, what are some aspects of your work that you want to change? Charity: Are there causes that you enjoy supporting with your time or money? Education: Are there professional or personal areas in which you want to become more knowledgeable or skillful? 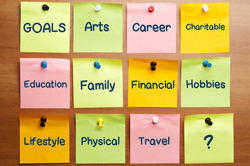 Family: How might you want to use your time or money to enrich your family life? How do you think this might change in 10 years? Financial: Do you have any financial goals, such as having $1 million by the time you’re 50? If so, what do you see this goal doing for you? Health: Do you have enough energy and comfort to do what you want? If not, what steps might enhance your ability to comfortably pursue the life you want? Hobbies: What do you enjoy doing with your free time? Is there anything keeping you from spending as much time pursuing this hobby as you want? Home: Are you comfortable and happy where you live? If not, what would you like to see change? Lifestyle: What do you enjoy about your current lifestyle? What if anything, would you want to change? Travel: Are there any trips on your bucket list? What locations? What would you like your accommodations to be like? What activities might you enjoy doing once you’re there? Achieving any large, long-term goal—financial or otherwise—can be challenging. You may find it common for clients to fail to save sufficiently for certain goals. Rather than frequently reminding them about rates of saving and spending, you may find that reminding them about their motivations may be enough to sway their behavior. Simply ask. Ask clients to tell you what it would be like to achieve a given goal and why that is important. When working with couples, be sure that each person has the opportunity to express him- or herself. Go for precision. For clients who are not comfortable expressing emotion, ask them to articulate sharp, clearly defined goals—for example, "One element of my retirement vision is to travel internationally once per year to a new location where I’ll learn about the history of the region" instead of, "I would like to travel more." Specificity enables clients to better envision the goal, thus making it more tangible and powerful. Challenge them. If you are having trouble understanding why a goal is important to a client, he or she may have formed it because of a conscious or unconscious obligation. Courteously question this—for example, “Is this something that’s important to you or that you feel like you should do for some reason?” This will help ensure that the goal actually is something your client truly cares about. Make it bite size. Discuss time frames and reassessment points for your clients' overall plans. Establishing stepping stones along the way will give clients opportunities to see their accomplishments and keep them from feeling overwhelmed. These conversations are invaluable. When you uncover clients' personal goals and motivators, they are much more likely to buy into the specific, actionable implementation plans you recommend. Clients who understand their most important dreams and drivers are more likely to be excited about following through on the plans they have agreed to. And that can make planning and working hard toward goals a more positive experience for you and your clients. How do you get clients to open up about their personal goals? How often do you revisit this conversation? Do you have other goal-setting tips for financial advisors? Share by commenting below!